CHINO, CA -- (MARKET WIRE) -- September 21, 2006 -- Today, The Ant Commandos (TAC), a leading designer and distributor of innovative peripherals and accessories for the gaming world, announced the launch of the Guitar Mania Amplifier 28r for PlayStation®, PlayStation®2, Xbox, and Xbox360. Rock out louder than ever before on the Freedom V Wireless, Rocking V Wired, and Shredder guitar controllers by turning up the two customized volume knobs on the Guitar Mania Amplifier 28r higher than any television speaker. Players can also jam to a clearer, richer sound with easy to use bass and treble knobs on the stylish silver face plate. The Guitar Mania Amplifier 28r plugs directly into a television or audio system via an audio/video cable and is compatible with any guitar controller and all guitar-based games including Red Octane's Guitar Hero™. 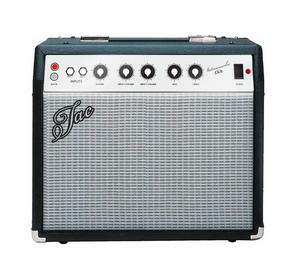 The 30-Watt amp looks like a real amplifier because it is one, sporting two 1/4" inputs for real electric guitars and microphones. Players will now have the ability to transform their living rooms into virtual arenas with the wireless technology of the Freedom V Wireless and the crisp sound of the Guitar Mania Amplifier 28r. Extreme rock enthusiasts won't want to miss the opportunity to purchase the Ultimate Rock Star Gaming Package, which includes both peripherals plus a bonus designer guitar strap for one low price! TAC provides a variety of accessories to complete the rock star experience. Check out designer guitar straps including the Flame Guitar Strap and Storm Guitar Strap. Customize each guitar with Gamer Graffix Skins designed to fit TAC's Freedom V Wireless and Rocking V Wired. Travel in style with the new V Controller Case, a sleek nylon guitar case designed to carry any Guitar Mania V Series guitar. For more information on the Guitar Mania Amplifier 28r, Guitar Mania Guitar Controllers, Guitar Mania Guitar Straps, Guitar Mania V Controller Case, or Gamer Graffix Skins please visit www.theguitarmania.com. For more information on the The Ant Commandos (TAC) visit www.theantcommandos.com. PlayStation®2 is a registered trademark of Sony Computer Entertainment, Inc. Guitar Hero™ is a trademark of Red Octane, Inc.
TAC is a leading designer, manufacturer, and distributor of innovative peripherals and accessories for the interactive entertainment industry. TAC's innovative designs follow our fundamental belief of Simplicity, Interactivity, and Mobility. TAC's commitment to pushing the design limits in these dimensions has spawned many new and exciting products for game enthusiasts worldwide. Rock out louder than ever before with <br> the Guitar Mania Amplifier 28r from TAC.